After more than 20 hours in the trailer (over two days from Texas to South Carolina), Snickers calmly backed off of our trailer, walked politely to his paddock, rolled in the rain soaked sand, took a drink, then started eating hay. This boy was made to compete all over the worl d! It is raining so hard that you only see a blur. You wouldn’t know it was him if you couldn’t see his blaze! A CPEDI para dressage competition begins with The Jog. This is where I fancy up my horse – button braids, Showsheen all over the body, blindingly white markings – and go to an in-hand trot inspection for soundness. This is the moment. If my horse doesn’t pass, I can’t show and this whole trip to Houston from South Carolina is over. Did I mention that my butterflies have butterflies? I hand the passport to one of the judges while my trainer presents my horse at a halt. Three judges look him over; One nods the go ahead. Quaterjack trots down a long, dirt path, around a plant, and back to the judges to await those magic words, “Number 51 is accepted”. Relief! Friday morning begins 3 days of intense competition with Team tests for each Grade tomorrow. I ride at 10:10. I must try to sleep now to dream of a perfect ten meter circles into shoulder in and expressive extended trots across the diagonal! After going to the Para Equestrian symposium in November of 2013, I committed myself to what was considered an elite athlete’s training regimen. After competing in Wellington at the CPEDI international show in February, I doubled that commitment by doubling the amount of training that I do daily. For months, my life has had to fit around the 6 hours a day, on average, that I devote entirely to training. It takes about 50 minutes each way to get to Aloha Acres, my training barn. Then every day – every day – I ride two horses – rain, sleet, or stultifying heat. And I don’t just ride, I train – hard. It’s a bit like fitting a full time job into an already full day before you even get out of bed. I’m not complaining, at all, because I love having these goals. (I am possibly too goal oriented.) This is meant to help others who may think that this kind of competition level can be achieved with a lessor amount of time and/or hard work. If you aren’t “All in”, as they say, I wouldn’t set National Championships or international competition as your goal. I really can’t believe it. This past weekend, I was able to finish qualifying my purebred Arabian, GM Major Soho (aka Wrigley), with a 69.75% freestyle, even with equipment failures. My rein handle broke about halfway through and I didn’t know whether to stop or keep going, so I kept going. He will join a Hanoverian, Freemont (aka Monty), in the trailer to Gladstone, N.J. We leave a week from Friday and will drive to the Virginia Horse Park, stay the night, and arrive at Gladstone on the 31st. This is my mantra and I believe it to my bones. At 14, I read Ayn Rand’s Atlas Shrugged and it changed my life. You may have an opinion regarding her political views but, for me, she was saying the same thing that Stephen Covey said above. Each day, I make decisions about who I want to be, about what’s important to me, and about what I want the final product of Pam Hardin to be. My life is a product of my decisions. I try to keep that mantra in my brain at all times so I can make the best decisions as often as possible. Bronze Medal – Who Would Have Thought? In USDF classes, a rider may earn the Bronze Medal by attaining two qualifying scores in each of First, Second, and Third Levels tests. I never thought that it was even a possibility for me. Now, don’t get me wrong, there are very few things that I believe that I can’t do, maybe not necessarily well, but do. Going up the levels was a rainbow dream. I figured that Training and First Levels were going to be my dressage home base. Starting in dressage less than 3 years ago, I knew nothing about dressage and nothing about being a para-equestrian. Having a Dispensation to use special equipment when riding in USDF able-bodied classes has allowed me to move up the levels. I truly never thought that I could manage a half pass, canter/halts, or a walk pirouette. A Silver medal looks far, far away but the Bronze wasn’t even in the picture last year, so who knows? I got my invitation to Para Equestrian National Championships with Freemont (the Hanoverian), made my reservations for a hotel, and would dedicate myself to practicing all three tests over and over but I really want to bring two horses to the Championships. 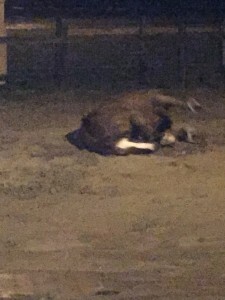 The Wellington jog taught me a lesson – a backup horse is always a great idea! Okay, maybe my eyes are crossed because I’m exhausted training with two horses every day, then coming home and “head practicing”. I wake up with freestyle music in my brain! It will all be worth it, I hope. Qualifying Scores with my Boys! 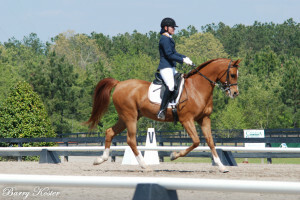 I was definitely doing the happy dance this past weekend in Aiken, SC at the Spring Fling Dressage show. I can actually stay at home when showing there, so it is a real plus and makes taking two horses more affordable. My hope was to get a qualifying Second Level score for my Bronze Medal on Freemont (aka Monty), which I did. Now, all I need is one more and that highly prized medal is mine! For those of you that are like me a year or so ago, the Bronze Medal is earned by the rider achieving two qualifying scores at First, Second, and Third Levels. A Silver Medal is the same but at Fourth and Prix Saint George. I can’t even think past that to a Gold Medal! I also took my purebred Arabian gelding, GM Major Soho (aka Wrigley) through the Grade III Individual Para-Equestrian Championship tests for the very first time qualifying him for Para-Equestrian National Championships! Everything I had dreamed of doing, we did. Between the support of my trainer, Melanie Mitchell, and all 15 or so of our friends who showed up to cheer us on, I couldn’t have asked for a more successful show. Now, I am filling out the paperwork for another show in 10 days to, hopefully, earn my remaining Second Level score and do Para-Equestrian Grade III Musical Freestyles on both of my boys. That way, both will be fully qualified for Nationals at Gladstone, NJ in June! Fingers crossed. Heck, crossing everything! We are all born with “special” circumstances, whether they be limitations or expectations. It cannot be your circumstance which defines you. Each moment, you make decisions on how to either vanquish or utilize your situation. Be better prepared to live with your choices by making thoughtful ones as often as possible. Remember, even indecision is a decision.